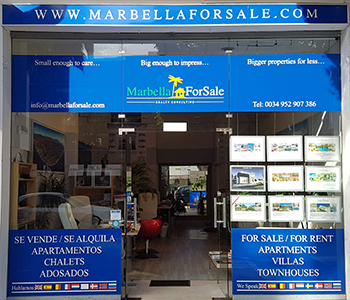 Marbella For Sale has been operating since 2007 and has created an extensive database of properties in Marbella and its surrounding area. Our offices are situated in Puerto Banus, the most exclusive area of Marbella, and this ideal situation allows us to offer the best selection of properties in the area. If you are looking to buy, sell or rent a property in or around Marbella or the Costa del Sol, we guarantee you a professional and personalized service with straight forward advice. Our team of experienced and multilingual real estate consultants will work to find the best solutions for your needs. With our indepth knowledge of the Costa Del Sol real Estate market we can identify a bargain when we see one and our mission is to focus on quality not quantity, and only sell the properties that represent exceptional value for money. Click here to visit our main website and browse through our other properties.